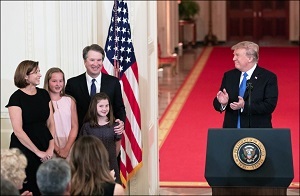 There is something revoltingly un-American about a man who stands with his wife and two young daughters to accept the nomination for the highest court in America, talks about feeding the homeless and coaching girls’ basketball – all the while knowing that a lot of very dirty corporate money lurks in the shadows of his nomination. We’re talking about the fact that Trump made his Supreme Court nominee selection of Brett Kavanaugh from a list that was pre-approved by the Federalist Society – a receptacle for the dark money that flows from the billionaire Charles Koch’s network of corporate polluters and democracy-killing front groups that got the Supreme Court to rubber stamp unlimited corporate money in political campaigns via the Citizens United decision in 2010. This entry was posted on Tuesday, July 10th, 2018 at 10:30 am and is filed under Immediately available to public, Phil's Favorites. You can leave a response, or trackback from your own site.